Fix "Backup WhatsApp to iCloud Stuck"
Fix "iTunes Cannot Restore Backup"
Apple has introduced some of the amazing devices but there are still some issues that it has not been able to resolve yet. The service of iCloud backup is a blessing for many individuals but sometimes restoring the files back to your device can turn out to be a daunting act. Recently, most of the people are suffering from this issue and the only question they ask is how to restore from iCloud backup without restoring. Here we have everything you need to know about the procedure and some tips to help you out. Part 1. Restoring from iCloud Backup via Apple Official Way? Before you start to restore your files from the iCloud backup there are several issues that you have to consider. Restore from iCloud can cause the data loss. 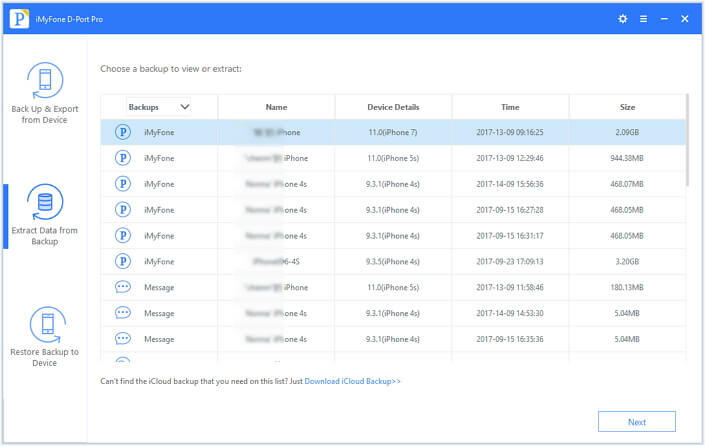 If all the files are not accessible for the latest iCloud backup that you want to restore, there are chances that you will lose the new content of your phone once iCloud will back up the old files and rewrite the data on the existing files. When you want to restore the files from iCloud you will not get the facility to select the preview the files. Without this facility, the only option left is that you will have to restore all the data whether you need it or not. You will have to wait for the whole process to complete to see the files that have been restored. The biggest disadvantage of the process is that often takes extra-long to finish the restoration. There are cases when the files have video or photos. In this case, it might even take a few hours to restore all the files. The worst part of the restoration from iCloud is that if you do not want the files back on your device you will have to delete them manually that will waste your time once again. It has to be done if you want to save more files. During the restore process, it often happens that the iPhone gets stuck. There might be an issue with the restoring process or there might be something wrong with your device. There have been many cases in which the iPhone gets stuck. If you are planning to selectively restore the files from your iCloud backup, iMyFone D-Port Pro is the perfect tool for the job. It is the perfect alternative for the iTunes and iCloud backup services. When you will start the restoration of the files you will never have to deal with the failure notification or restore is not complete. 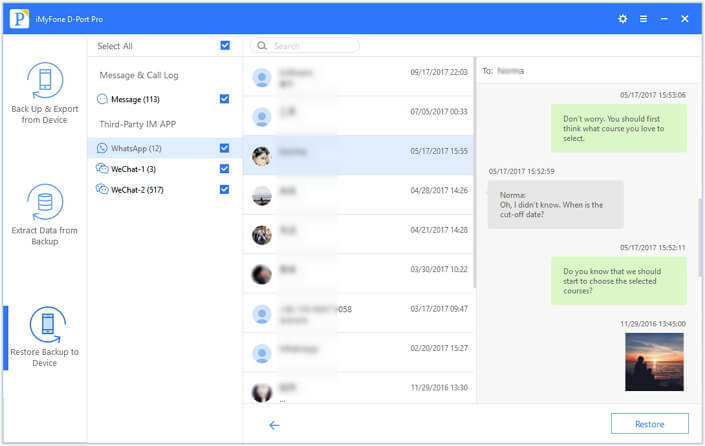 The biggest attraction of iMyFone D-Port Pro is that it will allow you to separately restore all the files including messages, WhatsApp chats, images, and documents. You will not have to overwrite any of your previous data. You can even restore the files from different platforms like iCloud and iTunes. 20 different types of files can be easily restored with the help of iMyFone D-Port Pro. The software is completely compatible with iOS 11, 11.1, 11.2 and above. Here is the step by step guide on how to selectively restore iPhone from iCloud backup with iMyFone D-Port Pro. 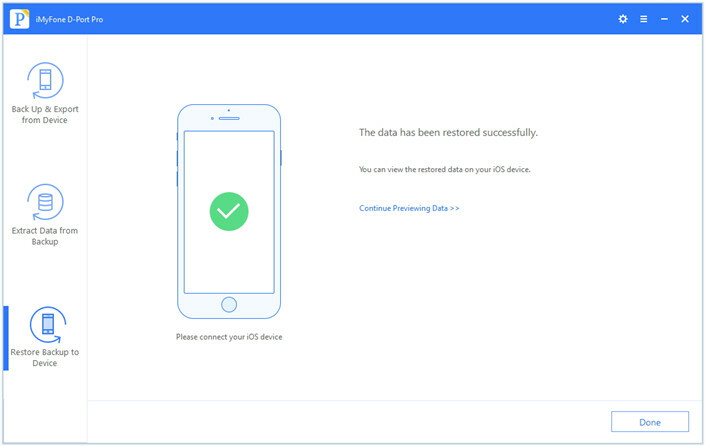 Step 1Click on Restore Backup to Device option and select an iCloud backup that you want to restore to your device. 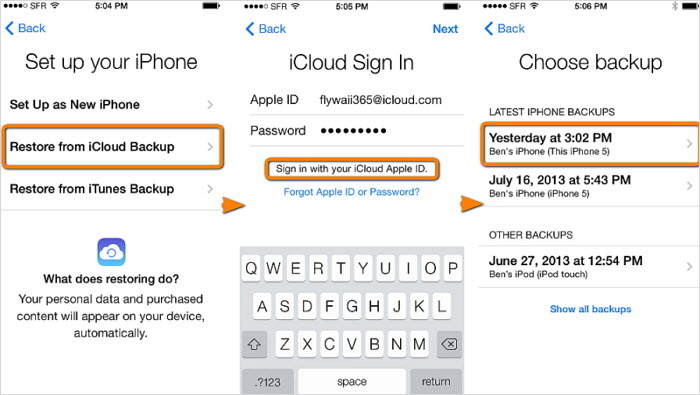 Or you can log in to your iCloud account and all the iCloud backups will be available. Click on the backup that you want to restore and select the option of next. Once you click next the file will be downloaded so you can scan it. 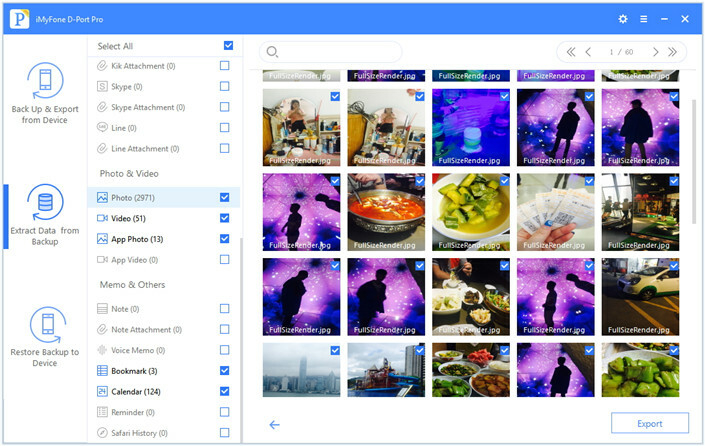 Step 2After you have downloaded and scanned the files you can preview the backup data in detail with the help of iMyFone D-Port Pro. Step 3Once you have checked that all the files you need are available you have to select the option of restore. 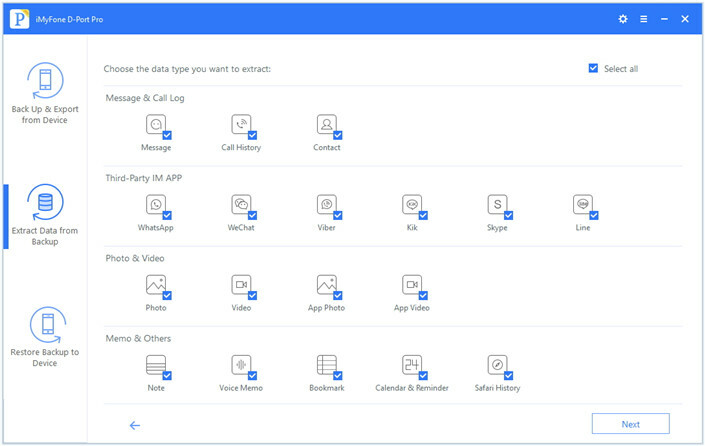 It will take a few seconds and then you can easily review and use the data on your device. Make sure when the iMyFone D-Port Pro is restoring your files you should not disconnect your phone. If you are planning to extract your files from the iCloud backup here we have the simplest procedure that you can use. Step 1Click on Extract Data from Backup tab, then click on the option of Download iCloud Backup. 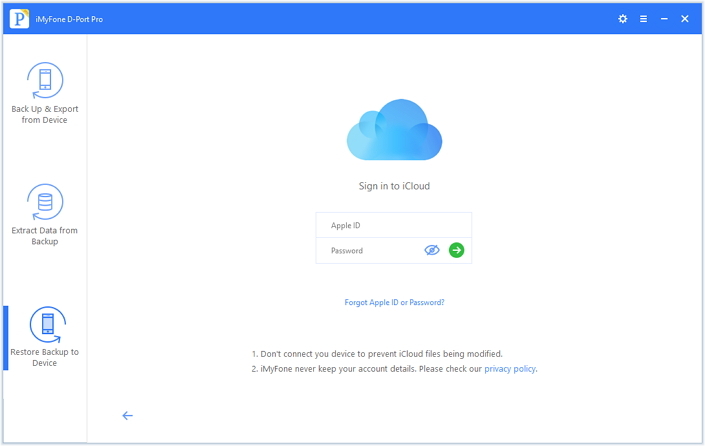 Now you have to log in to your iCloud account. All your Apple record and other information will be deleted because your privacy is very important for iMyFone D-Port Pro. Step 2Once you are on the next severe you will have to specify the types of files that you want to be scanned by the software. In this way, you can save some extra time that is used for the restoration of the iCloud backup files. Step 3 When the scan has been completed you can easily preview and select all the files that you would like to extract. Once you are done with selection all you have to do is select the option of extract and all the files will be restored to your computer. Make sure that you properly select the files so that none of them will be left. It will take a few seconds for extraction. 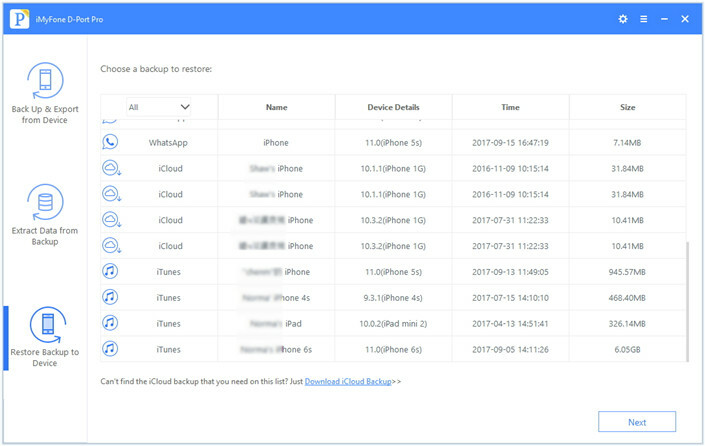 We hope that now it is clear to you that how to restore from iCloud backup without restoring. Make sure that you select the method that you are most comfortable with. iMyFone D-Port Pro is a reliable software that will allow you to quickly restore the files after a phone upgrade. The services of the software are available at affordable rate and you can use it to accomplish different tasks related to your iPhone. Select the package that meets your requirements perfectly, so you will never lose even a single file. With five years' experience dealing with technical issues on iPhone/iPad/iPod, Francisco Spearman has devoted herself to sharing a series of how-to tips on iOS devices and wins high reputation from users.